I had stopped working on this fluorescent embroidery because I didn't like working with the rayon threads and couldn't really see where it was going as an artwork. When I was at the Queensland Brain Institute, Dr Adam Hamlin's PhD student, Lavinia, showed me some images she had made of cell birth and growth in the dentate gyrus of a mouse that had had a stroke (ischemia). She had tagged the newborn neurons with a green fluorescent marker and other structures nearby with a pink fluorescent marker, then taken two images, one showing the green fluorescence and one showing the pink fluorescence. When the two images were overlaid, it was easy to see the relationship between the newborn neurons and other activity in the brain. 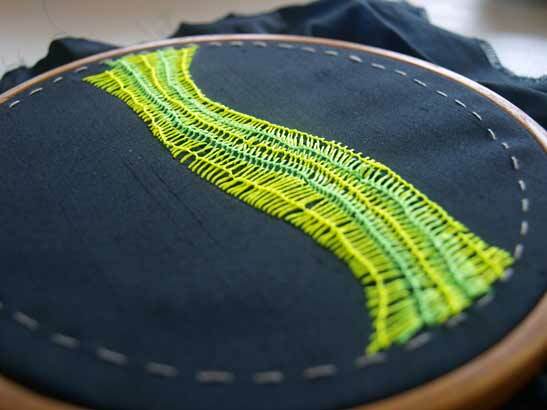 With this in mind, I went back to my fluorescent embroidery. Once I've finished the knotted loop stitch, I plan to add an overlay of tulle or sheer organza with hot pink seed beads scattered all over it. I'm trying to figure out how I can make the overlay removable when I display the work: perhaps some kind of a double frame will be the answer.